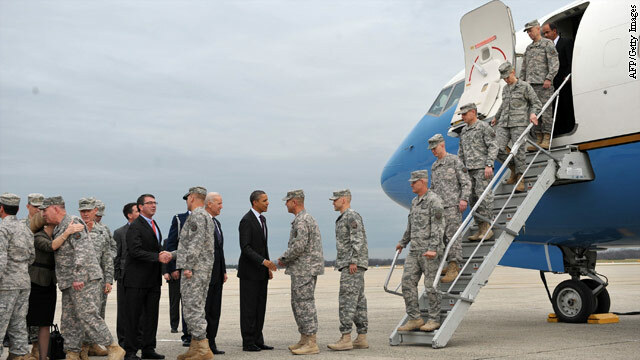 President Obama and Vice President Biden take part in a ceremony to mark the return of the US Forces - Iraq colors on December 20, 2011 at Joint Base Andrews in Maryland. The White House plans to hold a formal dinner in the coming weeks honoring Iraq war veterans, the fallen and their families, a senior DOD official has confirmed. He declined to be identified pending a formal White House announcement. The official said the dinner for some 200 people will include military personnel of all ranks, but the focus will be on enlisted personnel who served in Iraq. The dinner comes as the veteran’s advocacy group Iraq and Afghanistan Veterans of America has been pressing for a ticker tape parade to specifically honor veterans of the Iraq war. The senior official said top US military officers are opposing holding a parade for the Iraq war, “while there are still troops in harms way,” fighting in Afghanistan. “A New York city style ticker tape parade has come to represent a major national tribute,” the official said. As I posted below – this is a very appropriate thing to do. "Rob" I am not sure what you are using as a guideline because every key indicator is worse than when GB was in office. When you say "this country will fight to be the best" what are you talking about? Is this similar to C Sheen saying he is "WINNING"? As a matter of fact, the unemployment number is higher today then it was after BO took office. Housing is in trouble, gas prices are set to hit record highs this summer, this country owes over 16 trillion and BO is proposing billions more in spending. LoL! Thats pretty funny John the Tea Man! Where did you get 16 trillion from??? Wow! You probably should expand your horizons,other than Fox!!!! Haa? And whatever Sheen is doing, you should probably try that also! Rob – What does your show, MSDNC, tell you what the debt limit is? I say it to you libs all the time – Fox is the number 1 rated news on the air – it actually beats the main stream media channels, who have several million more people who can access their channels. Although I watch and read everything from Media matters to MSDNC to C-Span I like the way Fox actually has people from both sides of an issue (unlike those lib stations) Who do you watch? Blueberry pie guy – Al? BTW, Fox had the Clint Eastwood commercial on Saturday when they were reviewing the superbowl commercials. It seems your station is only 3 days behind if you just saw it last night. Great Speaker of the House to, John??? Him and Cantor,walsh,ect. "Are a real Bunch of "Can Do Guys" Gop Congress= Worst in American History??? You Goppers are "OUT THERE"???? WOW You dizzy me with your intellect???? So a ticker tape parade is done for the giants winning the suporbowl but not for our Vets. Our country needs to get its priorities in order. Very appropriate. Good job BO..
His performance as President of the USA is pwhoserirtay.He has inspired the World Leaders to create atmosphere for long wanted Peace.But recently his demand for billions of Dollars for finishing war in Afghanistan and Iraq continue to disturb the Asians @ Mid eastern Countries.Since he has been awarded the most prestigious Noble Peace Prize He should work more on dialogues and not much on confontation.The entire world is watching his activities eagerly.People expect from him global peace .His domestic programmes have been so far brought hope and for the people of his Country.It is hoped that he will remain as active as he was in his first year in office.He will work for downtrodden people of the world wherever they are from.Let him be active as ever. If you watched the ientrview, you could see that good ole Joe was completely taken aback by her questions. At one point he even asks her Is that a real question? As if he can't believe that someone in the media is actually asking a question that isn't tailored the the Obamessiah campaign's talking points. Can there be any better evidence that the campaign and everyone associated with it expects the media to softball them at all times?